Election Uncertainty: It’s Crunch Time. 26 SepElection Uncertainty: It’s Crunch Time. The Presidential Election has tightened in recent weeks as Trump has surged in the polls just as the debates are set to begin. Volatility has increased and could remain somewhat elevated until we see some clarity with the eventual winner. In our opinion, any weakness from the election uncertainty would present a buying opportunity given the firm technical underpinnings of the market, continued moderate economic growth, an improvement in corporate earnings following five consecutive quarters of declining earnings growth, and historical election year tendencies. Dating back to 1900, the market has gained an average of 3.8% from the beginning of September through December during election years and posted gains 79% of the time. If history is any guide, the average historical gain of 3.8% would render a target of 2253 on the S&P 500 by year-end. It is often said that the market dislikes uncertainty, and the market has had to deal with a lot of uncertainty so far in 2016. It began with the Deutsche Bank turmoil that led to a decline into the February 11 low and then the Brexit event that shocked the markets and led to a brief two day decline. The market has been very resilient and quickly recovered from both of those events. The other cloud hanging over the market has been the Presidential Election. As students of market history, we think it is important to have an appreciation for historical precedent. 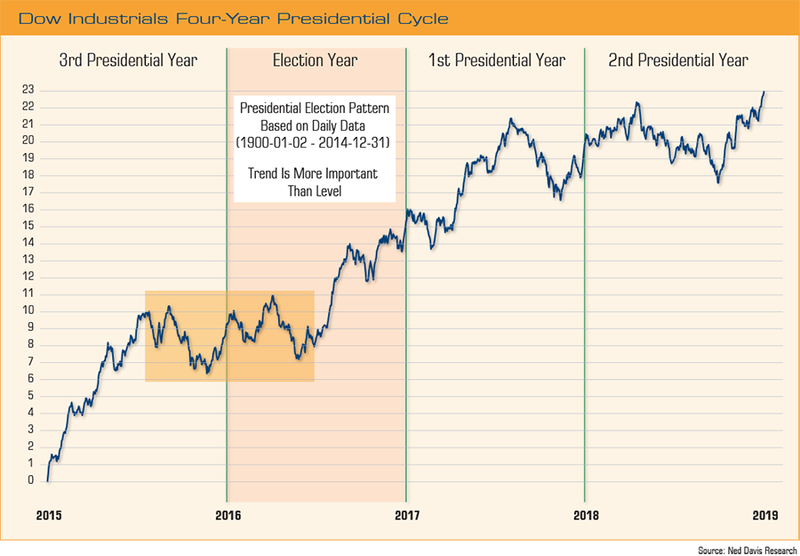 This chart of the four-year Presidential Cycle had suggested a trading range for the market from mid-2015 into mid-2016, which is similar to the environment we went through from the May 2015 highs until that trading range was broken to the upside this past July. In addition, it shows that the market has historically been positive in the election year, with most of the election year strength occurring in the second half of the year. Often the timing of an election year rally depends on when the winner of the presidency is well known, or discounted, regardless of party. From an historical perspective, there have been 17 post WWII elections and the median gain for the S&P 500 in an election year is 10.4%; the average gain is 6.6%. However, the market has fared better in the election years when there was a Democrat in office. There have been eight such cases, and the S&P 500 has gained 11.7% in those election years. Breaking it down even further, it didn’t seem to matter much if the Democratic incumbent won or lost. In the years in which he won, the market gained 11.5% and when he lost it gained 8.8%. The economy and stock market performance have historically played a role in the eventual outcome of the election. On those two fronts, the current economic health has correlated with the history of the incumbent party retaining office, and the year-to-date market performance is also closely tracking the incumbent party retaining control of the White House. The strength of the economy has been a big determinant of whether the incumbent party has won or lost, evidenced by the slogan “It’s the economy, stupid!” In the 29 Presidential Elections since 1900, the economy has been in a recession five times on Election Day. Four of those times the incumbent party lost. The exception was 1948, when the economy entered a recession during the month of the election following Truman’s victory. Conversely, when the economy has not been in a recession, the odds of the incumbent party retaining control of the White House has jumped to 71%. Of the seven cases when the incumbent party has lost when the economy was not in a recession, four saw recessions occur within eight months of Election Day (1912, 1952, 1980, and 2000). We don’t see any evidence of a looming recession and, in fact, we expect the economy to pick up momentum. The Conference Board’s Index of Leading Economic Indicators (LEI) is currently at a new recovery high and there has not been a single recession in the U.S. over the past 50 years in which the LEI wasn’t declining first by an average of 11 months. We are not seeing any weakness currently in the Leading Indicators Index and, if history is any guide, the U.S. economy should continue its expansion well into 2017. The performance of the markets has been more closely tracking an incumbent party victory instead of an incumbent party loss. According to Ned Davis Research (NDR), during years in which the incumbent party has won, the market has bottomed earlier (on average a low for the year on January 21 and a higher low on May 26) versus when the incumbent has lost (on average a low on October 25). So far this year, the market’s low was on February 11 with a higher low on June 27. That would seem to be consistent with an incumbent victory, however there is one caveat that makes this election result more uncertain. Another stock market barometer related to the election is whether the Dow Jones Industrial Average (DJIA) is higher or lower from the end of the second convention until the day before the election. 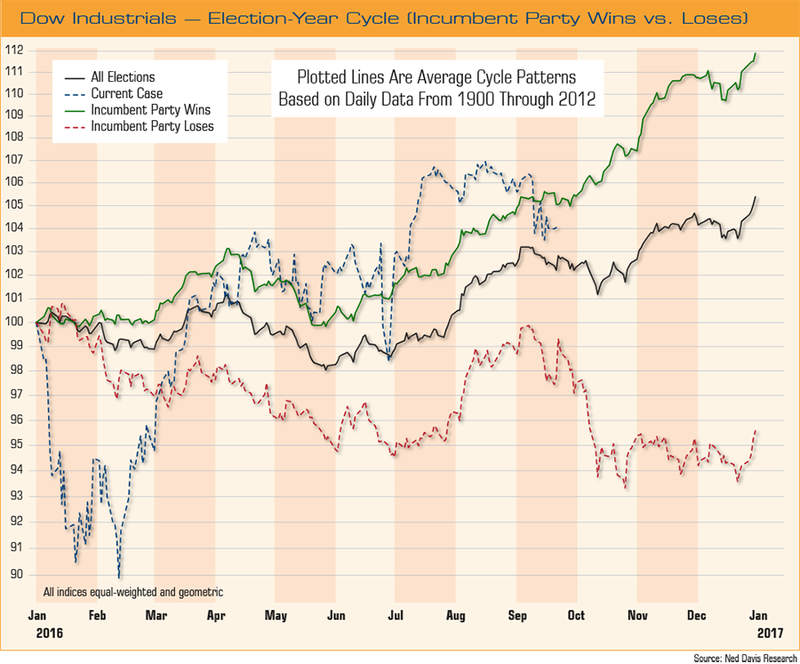 Since 1900, when the incumbent party has won, the DJIA has rallied a median of 5.7% versus -1.5% when the incumbent party has lost. The Democratic Convention ended on July 28 with the DJIA at 18,456.35. The market performance between now and the election will be very telling and the election could hinge on the Federal Reserve’s interest rate decision and how well the candidates do in the debates. The market has recently become more volatile as the polls have tightened and show Trump in a virtual dead heat with Clinton, once the prohibitive favorite to win in November. The tightening of the polls has injected a layer of uncertainty and skittishness among investors given the unknown effects on the markets and economy of the candidates’ policies. Historically, a pickup in volatility is not uncommon as the election draws near. 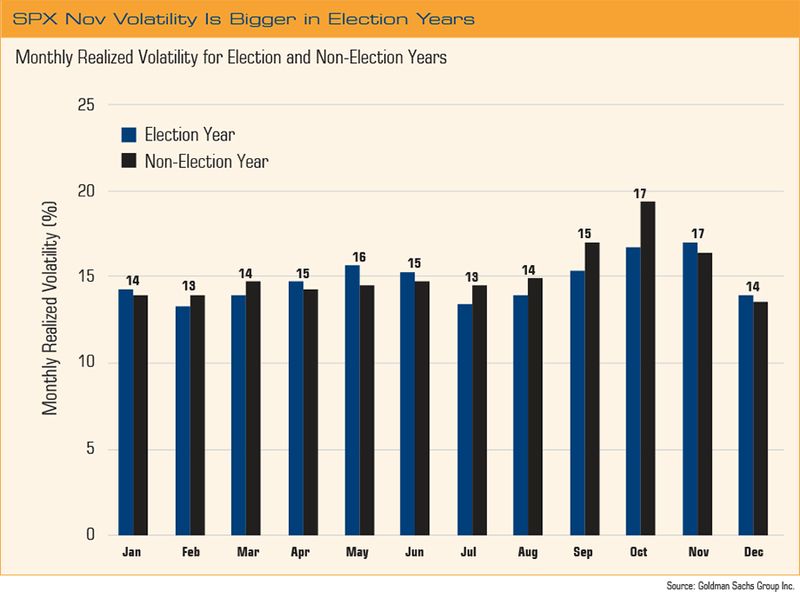 While October has historically been the most volatile month of the year for the S&P 500, that trend has been seen to change in election years where S&P 500 volatility tends to rise and remain somewhat elevated into November. At the present time, even with the polls tightening, it looks as if Trump has a very narrow path to the White House, with Clinton’s path to victory looking much easier. However, a third term by either party is rare. Since 1900, a party has won the Oval Office for at least three consecutive terms seven times, with the feat being accomplished only once since 1948, when President Bush 41 was elected in 1988 following President Reagan’s two terms. The last time a two-term Democrat turned the White House over to another Democrat was Andrew Jackson to Martin Van Buren in 1836. We could see a continuation of divided government. Either way, we feel neither the Senate nor the House will enjoy much of a majority. It’s likely that Democrats in the Senate will have at best a 52-48 margin, and the Republican majority in the house is likely to shrink from 30 to the mid-teens. So, we may see four more years of gridlock in D.C.
We believe a Clinton victory would mean more of the same policies and regulations that have existed under President Obama and the market seems comfortable with that. It appears that a Trump victory would raise the odds of a more aggressive fiscal policy, which Trump outlined in a recent speech at the Economic Club of New York. Trump claimed that his program of tax cuts and expanded spending, along with trade and regulatory changes, would generate real annual growth of 3.5% but would be “deficit-neutral” by reducing each dollar of nondefense and non-entitlement federal spending. In our view, the market seems to be a little anxious over Trump’s policy initiatives given the recent skittish trading. In our opinion the big economic issues of this election are the Federal Reserve, trade, tax policy, and regulation. Under a Clinton presidency there will likely be very little change at the Federal Reserve. The Fed would likely remain more dovish than the alternative, and longtime Clinton friend and ally Lawrence Summers would likely be in the running for the position of Chairman should Yellen decide to retire. Under a Trump administration, we believe the Fed would likely take a more hawkish tone and could be a little destabilizing with the Fed audit crowd gaining support. Clinton comes off as an internationalist and Trump as a protectionist. However, in reality they are both closer to the middle of the spectrum. The Trans-Pacific Partnership (TPP) is a hot button with Clinton who is now vowing to kill the trade deal she helped push as President Obama’s top diplomat. If it passes in a lame-duck session, Clinton would probably not try to block it, contrary to what she said. Trump on the other hand has been in opposition to TPP, but when push comes to shove, we believe he will not want to get into a trade war with China and it is very unlikely that Chinese tariffs would be meaningfully altered. The tax policies proposed by the two candidates are quite different, but also too lengthy and complicated, as is the current tax code, to get into here. In short, tax policy needs to stimulate growth as growth drives revenues. It is the difference between one candidate promoting lower marginal tax rates to drive revenues through economic growth and the other candidate driving revenues through taxation. As an example, Trump would use an easier, less punitive tax code to help stimulate economic growth. Trump has proposed fewer tax brackets and lower rates for most individuals, lower capital gains and dividend taxes, and lowering the corporate tax rate from 35% to 15%. Clinton’s tax plan is pretty much a continuation of President Obama’s plan. She proposes a small increase in taxes that would be borne almost entirely by the wealthy. She has called for higher capital gains taxes to discourage short-term investing and would install a sliding scale of rates, with shorter-term investments taxed at higher rates than at present and no change to the top rate. Regulation can have a real impact on economic growth and it can happen much quicker through executive action than going through the normal legislative processes. Trump has called for deregulation to get the Federal government out of the free market and said that government regulations should be pared back to ensure their benefits outweigh their costs and that they don’t eliminate U.S. jobs. Trump said he wants to repeal the Affordable Care Act and called government regulation a “stealth tax.” Clinton supports tightening Wall Street regulations and would continue many of President Obama’s regulatory policies. In October 2015, Clinton wrote an op-ed1 for Bloomberg detailing her proposals for Wall Street reform. She recommended protecting the Dodd-Frank Act, eliminating the carried interest tax loophole, imposing a “risk fee” on banks with more than $50 billion in assets and enacting a “high-frequency trading” tax. 1. https://www.bloomberg.com/view/articles/2015-10-08/hillary-clinton-s-plan-to-prevent-the-next-crashPast performance is not indicative of future results. The opinions expressed are those of the Clark Capital Management Investment Team. The opinions referenced are as of the date of publication and are subject to change due to changes in the market or economic conditions and may not necessarily come to pass. Material presented has been derived from sources consider to be reliable, but the accuracy and completeness cannot be guaranteed. The Dow Jones Industrial Average is comprised of 30 stocks of large, public companies in the United States that are important factors in their industries. The S&P 500 Index is the Standard and Poor’s Composite Index of 500 stocks and is a widely recognized, unmanaged index of common stock prices. The volatility (beta) of an account may be greater or less than the indices. It is not possible to invest directly in these indices. Clark Capital Management Group, Inc. is an investment adviser registered with the U.S. Securities and Exchange Commission. Registration does not imply a certain level of skill or training. More information about Clark Capital’s advisory services can be found in its Form ADV, which is available upon request.